This combination of a baked potato and chicken reminds me of my nursing days in New York. 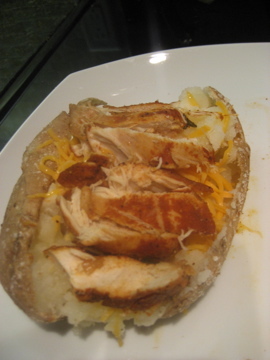 I used to frequent the deli across the street from the hospital to get their baked potato with grilled chicken. For some reason that was what I craved when I worked nights. Anyways, this is my take on it and I used my leftover crock-pot chicken from last night. 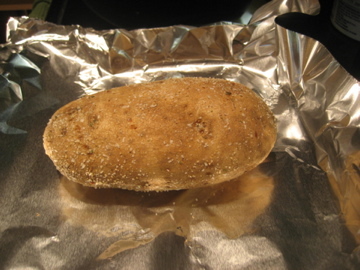 Wash potato, poke holes in the potato with a fork (so it does not explode) and sprinkle garlic salt on the outside. ***TIP-do not wrap the potato as you want the skin to get crispy! Cook the potato for 1-1.5 hours depending on the size of the potato. Heat chicken (if not hot already) in the microwave and slice. Dress your potato with whatever ingredients you choose and enjoy!